President Trump appears with Secretary of State Rex Tillerson at a Monday Cabinet meeting, where he announced North Korea would again be designated as a state sponsor of terrorism. President Trump says this should have happened years ago. In fact, North Korea was on the list until 2008, when the Bush administration took it off, in an ultimately failed bid to salvage a denuclearization deal. Trump's move won praise from members of Congress, who supported legislation that paved the way for North Korea's return to the blacklist. "Over the past year alone, Kim Jong Un and his regime brazenly assassinated his brother with a chemical weapon and brutally tortured Otto Warmbier, leading directly to his tragic death," writes House Foreign Affairs Committee Chairman Ed Royce, R-Calif. "These aren't isolated incidents, but are examples of a consistent pattern of terror." President Trump also mentioned Warmbier in his brief statement at the beginning of a Cabinet meeting on Monday where he made the announcement. Warmbier is the UVA student who was spent a year and a half in a North Korean jail only to return in a coma. He died a week later. Secretary of State Rex Tillerson acknowledged that putting North Korea back on the terrorist list is a largely symbolic move, with limited practical effect. "It just points out again what a rogue regime this is and how brutal this regime is and how little they care for the value of human life," Tillerson told reporters. "I don't want to suggest to you that the designation is going to put a whole new layer of sanctions on them," he added. "We already have North Korea so heavily sanctioned in so many ways with the UN resolutions that have been undertaken. But this will close a few additional loopholes." Tillerson suggested other countries supplying North Korea with so-called "dual use" equipment — that could have both military and civilian applications — might think twice as a result of the new designation. The other countries on the State Sponsors of Terrorism list are Iran, Sudan and Syria. NPR's Scott Horsley and Arnie Seipel contributed to this report. President Trump is putting North Korea back on a list of state sponsors of terrorism. And this paves the way for new sanctions, which are expected to be announced today. Although, as NPR's Michele Kelemen reports, it's mostly a symbolic move against a country already facing sanctions from the U.S. and the U.N.
MICHELE KELEMEN, BYLINE: President Trump says this should have happened years ago. 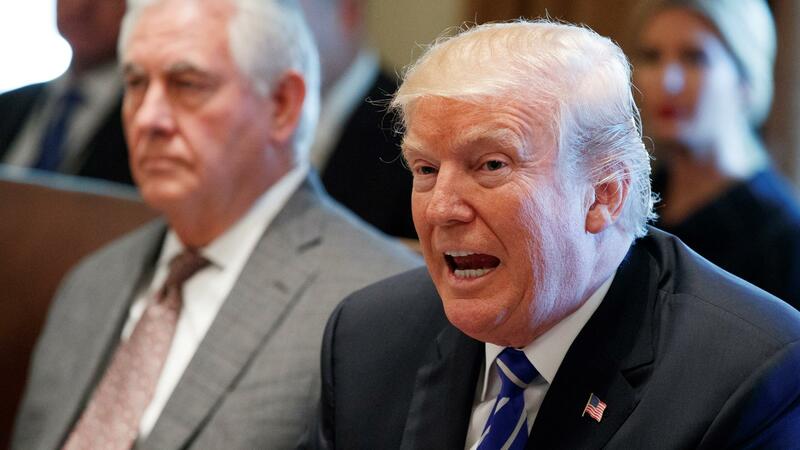 PRESIDENT DONALD TRUMP: In addition to threatening the world by nuclear devastation, North Korea has repeatedly supported acts of international terrorism, including assassinations on foreign soil. KELEMEN: Officials are only speaking publicly about one such assassination, that of Kim Jong Un's half-brother in Malaysia. Secretary of State Rex Tillerson explains why. REX TILLERSON: Well, that assassination involved the use of a chemical agent, a very dangerous agent, in a public place. KELEMEN: And that helped pave the way for North Korea to return to a blacklist that also includes Syria, Iran and Sudan. And though the death of an American student who was jailed in North Korea did not factor into this decision, President Trump mentioned him in the announcement. TRUMP: Our thoughts turn to Otto Warmbier, wonderful young man, and the countless others so brutally affected by the North Korean oppression. KELEMEN: The Bush administration took North Korea off the state sponsors of terrorism list in 2008, a move Mike Green criticized at the time. He's a former Bush adviser on Asia and says the North Koreans were supposed to follow up by providing documents on how the U.S. and its partners could inspect North Korean nuclear facilities. MIKE GREEN: The North Koreans never delivered. They pocketed the U.S. sanctions lifting but did nothing in response. It was a complete air ball, not even hitting the rim. KELEMEN: The Japanese felt betrayed, Green says, because the U.S. had promised to keep North Korea on the list until there was progress over Japanese citizens abducted by North Korea, and the move didn't help nuclear diplomacy in the end. And while some might see the Trump administration's move now as a step back from diplomacy, Green, who's with the Center for Strategic and International Studies, says there are few prospects anyway. GREEN: North Korea is rushing to finish the final stage of their marrying a nuclear weapon to a ballistic missile capable of hitting the United States. And it's very, very unlikely that any amount of sanctions or carrot diplomatic offerings will get them to stop. KELEMEN: Secretary Tillerson, though, says he still has hopes for diplomacy. TILLERSON: And this just continues to tighten the pressure on the Kim regime with - all with an intention to have him understand this is only going to get worse until you're ready to come and talk. KELEMEN: He acknowledges, though, that the North Koreans have demonstrated in the past that they're willing to withstand a lot to pursue a nuclear weapons capability. Michele Kelemen, NPR News, the State Department. (SOUNDBITE OF ANDREW BIRD'S "GYPSY MOTH") Transcript provided by NPR, Copyright NPR.